At the risk of turning this lifestyle blog into a more accurate representation of myself - glutton, I thought I'd throw in some fashion bits (aka Chanel) to even the balance. Anyway, let's talk about French patisserie for a second. I'm ashamed to say that I've walked down Rue Pavée in Le Marais on several occasions yet I've never once noticed the nondescript L'Éclair de Génie, located next door to my favorite sandal maker, K.Jacques Saint Tropez. Anne suggested we visit the store after our lunch at Merci and there was no way I would turn down that offer. I can't believe I've missed this incredible place ALL these years. A couple of well dressed elderly French ladies looked rather bemused and even laughed out loud at my desperate attempts to capture these beauties on the street in broad daylight. Yes, the wacky things that bloggers (okay, just me) do.......... The caramel éclairs are fantabulous! Lugging around a massive bag as well as an equally large DSLR has taken a toll on my shoulder. It's funny how well I'd survived today without having to carry my whole life with me for the entire day. Thank goodness, I'd brought a smaller bag which was spacious enough to stuff a battery charger, cellphone, metro tickets, cards, tissues and cash inside. Stephanie, it's the caviar leather WOC. As for the éclairs.....guess who ate all 4? ah - I was having trouble identifying the leather (slow brain...) and heh heh, I remember gorging on many pain aux chocolat myself. I swear I didn't notice them disappearing. It's only day 3 of gorge fest and I need to take it easy with the drawstring (notice I said drawstring, not skinny jeans). 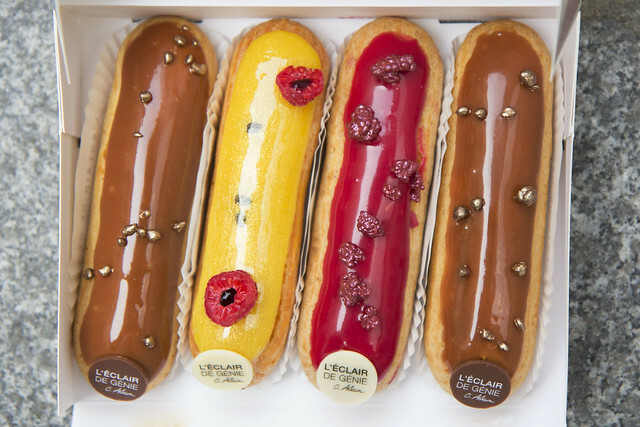 Ooo... love the fantabulous eclairs. what were each of the flavors? From left to right - caramel, passionfruit, framboise and caramel (I think you can guess which is my favorite). 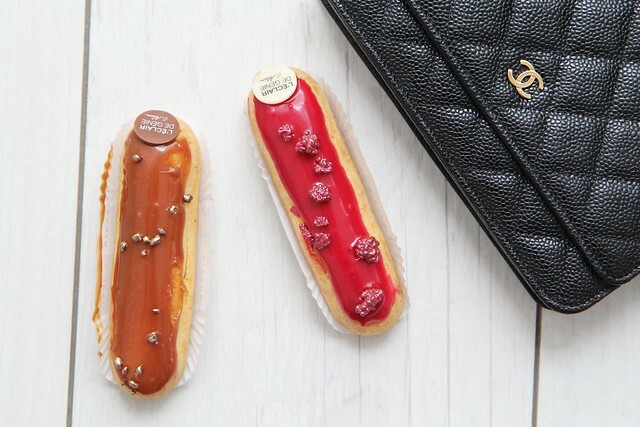 Oh, those eclairs look delicious!!! And love your WOC! Enjoy Paris!! Hope to see you in London sometime this year! 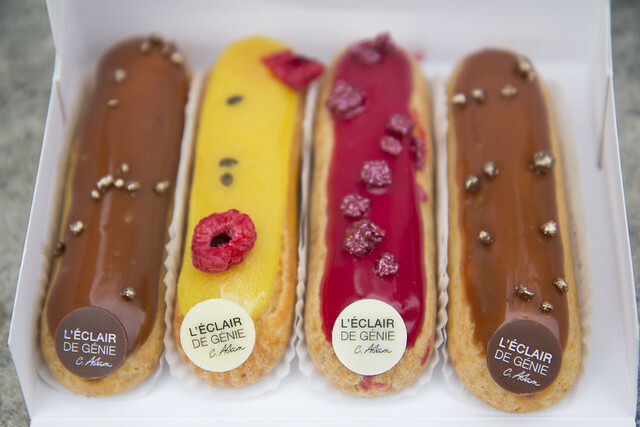 I don't eat eclairs as a general rule but I might have to give in to those beauties! Hope you're enjoying your food fest! Caramel is my absolute favorite too. Yup. I haven't shopped AT ALL. I've been eating non stop. So you're in Paris! You're lucky as the temp are getting a bit higher and pollution is not too high. I do hope you'll have time enough (and the will) to go and visit some other places than the touristy and posh ones (as Le Marais with plenty of beautiful old buildings and lots of trendy shop you'll find everywhere else, Colette and Merci shop): nothing against those but really there are plenty of interesting areas in Paris including in places many would find too crowded and full of migrants! Do dare to go and discover! I would advice you to go in some of the rare areas where you can find, well hidden, some of the most beautiful city houses, in the 13è, 14è and, of course, 18è. And if you are interested in true french typical rural cuisine, try to go to Bistrot des Vosges close to Bastille with typical Auvergne food (I know lots of calories, this is not very trendy, you could give a try but your friend may find it not trendy enough, no burgers...). Enjoy your stay anyway. Thanks for the tips. I'll go and try out Bistrot des Vosges. Any out of the way places in particular that you'd like to recommend?